Manchester City forward, Raheem Sterling scored a dramatic winner against Southampton as the league leaders won a club record 12 the consecutive league matches with victory over the Saints. The Citizens beat 2-1 at the Etihad on Wednesday night but the result showed City’s new found resolve. Former Liverpool star, Raheem Sterling scored a 96 th minute winner to break the heart of the South Coast outfit, but for a long time, City looked like dropping points for the first time in 12 matches. City manager, Pep Guardiola made two changes to the side that defeated Huddersfield on Saturday as Gabriel Jesus and Jesus Gundogan came in for David Silva and Leroy Sane while his opposite number, Mauricio Pellegrino made five alterations from the side that defeated Everton. The quintet of Yoshida, Romeu, Lemina, Redmond and Long coming in for the clash. The first half ended goalless but City turned up the screw after halftime, with Kevin De Bruyne’s free kick making it to the back of the net just a minute after the interval. 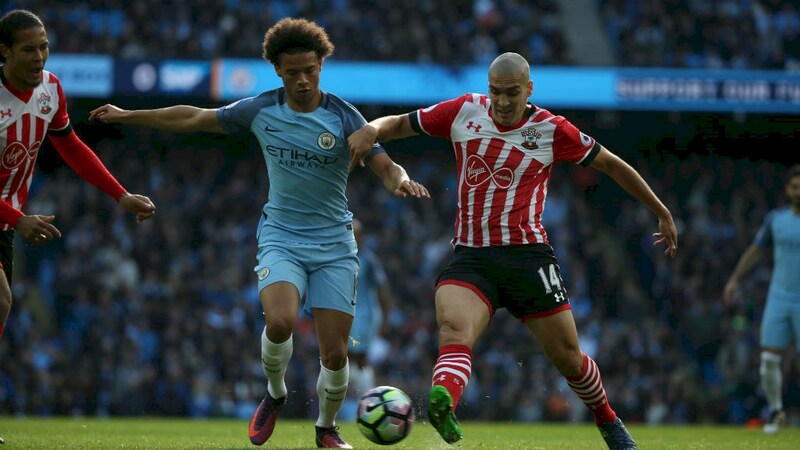 Former Barcelona midfielder Oriol Romeu, who played under Pep at Barcelona made it 1-1 fifteen minutes from time, though Sterling had other ideas. With virtually the last kick of the game, Sterling took the ball on the edge of the box, before curling home an exquisite winner past the outstretched arms of Fraser Forster. The result takes City to 40 points, which is the highest tally for any team in Premier League history after 14 matches. De Bruyne has a hand in 51 goals in the league (17 goals and 34 assists) since his move back to the league in 2015, the most by any midfield player in that time. At this rate, City look like they are marching to the title, and it would take some stopping for them not to win their third title in 7 years.